We are delighted to welcome back to our blog, the author Naomi Clifford. 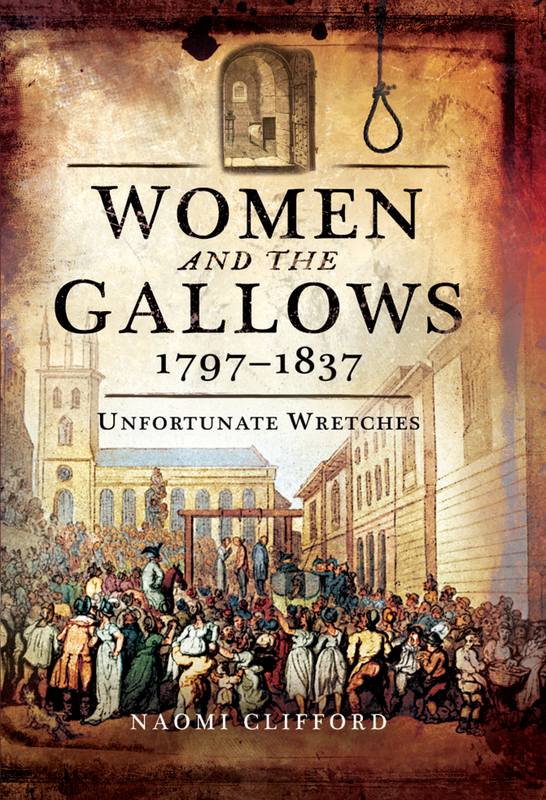 For her book Women and the Gallows 1797-1837: Unfortunate Wretches, Naomi researched the stories of the 131 women who were hanged in England and Wales between 1797 and 1837. Here she outlines the last days of the notorious poisoner Mary Ann Burdock. For 25% off the RRP and free UK P&P phone 01226 73422 or visit Pen and Sword Books and use discount code WATG25 on the checkout page. A record crowd waited hours in the rain to witness Mary Ann’s final moments, at 1.40pm on 15 April 1835. The Bristol Mirror estimated the numbers at 50,000 and described it as ‘the largest assemblage of human beings we ever beheld’, their mass stretching ‘the entire line of Coronation Road, from the distance of 200 yards beyond the New Church, to the Bridges, and from the top of the river banks down nearly to the water’s edge’. While they assembled there was a bit of a carnival atmosphere; people did not seem overly impressed with the seriousness of what was about to happen. Then at about 1.30pm, if they were close enough to get a good view of proceedings, they watched a small female figure dressed in black appear on the platform accompanied by the prison Governor, under-sheriff, turnkeys, executioner and the chaplain, the Rev Jenning. They might have heard Jenning intoning the funeral service… ‘I am the Resurrection and the Life…’ At this point, as understanding that events were reaching a climax rippled through the crowd, the feeling amongst the spectators changed. A ‘shuddering and anxious silence’ pervaded. Those close enough to the gatehouse would have perceived that there was a hiatus on the platform while an umbrella was called for – whether for Mary Ann or for the Chaplain was unclear. Probably only the official entourage on the platform and the newspaper reporters, who were allowed special access, would have heard the Governor ask Mary to move to her place on the trapdoor and her refusal: ‘I will wait for the umbrella.’ The Governor again insisted and again she refused. But the Rev Jenning resumed reading the service and Mary Ann was led reluctantly but not resisting to the drop. The journalists noted that her face suddenly drained of colour. Why was there such a degree of interest in this particular execution? Why such enormous crowds? Certainly, Mary Ann’s gender was a draw. This was the first hanging of a female in Bristol since 1802 when friends Maria Davis and Charlotte Bobbett were dispatched on St Michael’s Hill holding hands, punishment for abandoning Davis’s 15-month-old son on Brandon Hill where he died of exposure, and the first since 1832 when William Clarke, Thomas Gregory, Christopher Davis and Joseph Kayes were hanged for rioting. There was the added factor that Mary Ann was young – 30 or 35 at most – and attractive, and her crime had given her a new level of local notoriety. The public was much exercised at the time by an apparent spike in poisoning murders by women. Burdock was born Mary Ann Williams at Urcop near Ross on Wye in Herefordshire. Aged 19, she joined the household of Mr Plumley, a poulterer living in Nicholas Street, Bristol but was abruptly sacked for petty theft and ‘other improper acts’. Soon afterwards she married Charles Agar, a tailor, but he left her and she then lived with Mr Thomas, a married gentleman’s servant. Later, she ‘formed a connection’ with Mr Wade, who kept a lodging house at 17 Trinity Street. A son and daughter were born but it is not clear who their fathers were. Mary Ann appeared to live by her wits. She was illiterate and, as the middle classes tut-tutted to each other, had no knowledge of religion. It was in the Trinity Street house, in October 1833, that one of the lodgers, Mrs Clara Smith, a widow in her fifties, was suddenly taken ill with severe stomach pains and expired soon afterwards. Mary Ann told anyone who was interested that Mrs Smith had died in poverty and had no relations and she herself hastily arranged a burial for her lodger at St Augustine’s Church. But Mrs Smith was not poor. Quite the opposite. She was known to hoard large quantities of cash because she did not trust banks and kept her money, possibly as much as £3,000, in a locked box in her room. It did not go unnoticed that soon after her death, Mr Wade and Mary Ann started doing noticeably well: Wade was able to pay off his debts and bought £400 worth of stock to start a business. But Wade’s own run of luck was short. By April 1834 he too was dead and within weeks Mary Ann was bigamously married to Paul Burdock. She was still legally married to Charles Agar, of course. A few months later, Mrs Smith’s relatives, who had been living abroad, arrived in Bristol and started making inquiries about her estate. Suspicions were aroused. Mrs Smith’s body was exhumed and the contents of the stomach sent to the analytical chemist William Herapath of Bristol Medical School, who identified arsenic. On 10 April 1835 Mary Ann came to trial at the Guildhall before Sir Charles Wetherell, the same hardline anti-Reform Recorder of Bristol whose arrival in Bristol for the assize in 1831 had provoked civil disturbance during which four people were killed and 86 wounded and after which Clarke, Gregory, Davis and Kayes were hanged. Mary Ann’s trial lasted three days, ending with a nine-hour summing up by Wetherell, after which the jury retired for 15 minutes and returned a verdict of Guilty. Execution was inevitable . Understandably, she was in no hurry to proceed to the next stage and when reminded that it was time to go said, ‘Dear gentlemen, the time is short – it is hard to die.’ She asked to be remembered to her husband, who seems to have abandoned her, and friends. Faced with the stairs up through the gatehouse to the roof, she again hesitated but when the Governor offered assistance, declared that she could manage. On the platform, the executioner William Calcraft fastened the rope to the gallows, pulled the white cap over her face and placed a handkerchief in her hand. This was to be the signal she was ready for him to release the trap door. Within seconds she dropped the handkerchief and was hanged. ‘A thrill of terror pervaded every countenance,’ according to the Bristol Mirror. Mary Ann died relatively quickly ‘with a slight convulsive movement of the hands’, her ‘stoutness’ apparently helping to speed her end. Mary Ann Burdock’s body was taken down from the gallows and casts were made of her head and bust for the use of doctors at Bristol Royal Infirmary, after which it was buried within the precincts of the gaol, the Anatomy Act of 1832 having ended the practice of dissection of murderers’ corpses. Three weeks later ‘P.R’ wrote to Richard Smith, chief surgeon of the Infirmary, with the conclusions of a phrenological analysis of the casts, which concluded that they indicated Destructiveness, Combativeness, Secretiveness, a lack of Benevolence as well as ‘a masculine degree of force and energy’. That energy was, of course, now extinguished. The next and last person executed on the roof of the gatehouse was 19-year-old Sarah Harriet Thomas, convicted of bludgeoning her elderly employer to death. It was a traumatising scene. Sarah was dragged struggling and screaming to the roof of the gatehouse, pleading for mercy until the end. The prison governor fainted. 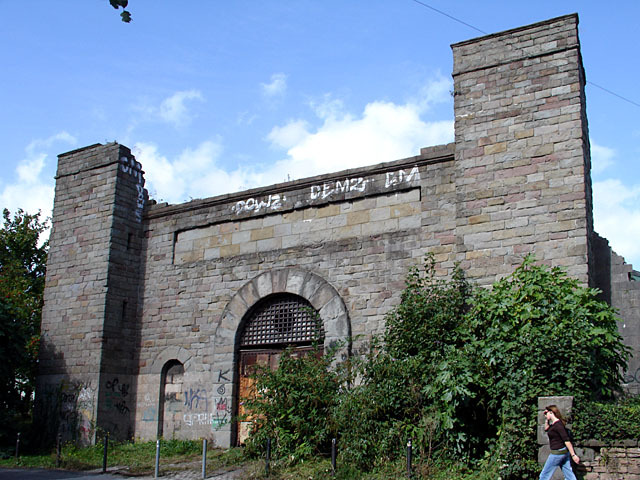 The gaol closed in 1883, replaced by the prison at Horfield, and the site was sold to Great Western Railway. The gaol ruins were gradually removed and the ground levelled for rail yards and buildings. The gatehouse, now Grade II listed, is all that remains. Now a shiny new development is planned, the entrance to which will be through the gatehouse. As they pass through perhaps residents and visitors will spare a thought for the souls who were dispatched just a few metres above them. A total of nine people were executed on the flat roof above the entrance to the gaol. The original gatehouse, first built in 1820, was demolished in 1831, having been damaged in riots, and was rebuilt in 1832. Historic England. Bristol Mirror, Royal Cornwall Gazette 18 April 1835. Charles Agar, Burdock’s legal spouse, later sued Stuckey’s bank for the contents of Mary Ann’s bank account, some of which was probably ill-gotten gains from Mrs Smith. He won. 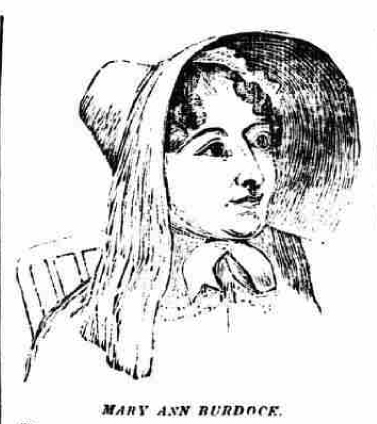 Bristol Mirror, 2 May 1835.